Winter hardy to USDA Zones 9 (possibly 8b) to 11 where plants are best grown in moist, fertile, well-drained soils in full sun. Tolerates part shade. Established plants have some drought tolerance (deeper roots than found on most palms). Prefers moist organic soils. Propagate from seed in spring. Butia capitata, commonly called yatay palm, pindo palm or jelly palm, is a palm tree that typically grows to 20-35’ tall and to 10-15’ wide. It is native from southern Brazil to Paraguay. 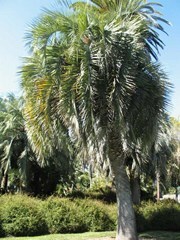 This palm is noted for its (a) comparatively short but stout solitary trunk (to 15’ long and 1.5’ diameter) which is usually covered with persistent leaf bases from the stalks of fallen leaves, (b) arching, thick-textured, marginally-spined pinnate leaves (8-10’ long) that often form a dense but loose crown, each leaf having 25-60 pairs of narrow pointed leaflets which are usually grayish green, but sometimes deep green or silvery blue, (c) axillary flower clusters bearing tiny, yellowish, fruity-scented, unisexual flowers of both sexes (male with 6 stamens and female with 3 stigmas and a solitary pistil), and (d) orange, rounded, edible fruits (each to 1” wide) with a fibrous but juicy flesh surrounding a hard stone. This species is frequently planted in the warmer parts of the U.S., as far north as South Carolina and San Francisco. Sweet fruit pulp is used to make jellies or fermented to make wine. Genus name comes from the vernacular name in Brazil for a species of palm (B. capitata). Specific epithet means growing in a dense head. Excellent tropical ornamental tree for the landscape. One of the hardiest of the feather-leaved palms.